It’s a no-brainer that a good customer relationship management (CRM) software can redefine your business. It boosts efficiency, saves money, improves your customer relationships and makes employees’ lives infinitely easier. But by how much, exactly, does it do all that? Making vague, sweeping promises (like, uh, the ones I just did) can be heartening – to a point. Eventually, you need to drill down to the numbers and understand exactly how much, on average, shifting to CRM software will save you. You need statistics to get company buy-in, and we’re here to help. To start at the most important: what’s the ROI? It’s always a fuzzy area, but according to a 2014 report by Nucleus Research, CRM software earns companies $8.71 for every dollar spent. 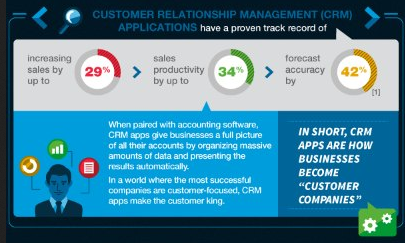 That’s actually an increase from Nucleus’ 2011 report, which found companies earned $5.60 for every dollar spent on CRM, indicating that the value of CRM has increased over time. That’s likely because the software has continued to upgrade, emphasizing sweeping integrations and smarter segregation tools. We expect the number will increase even more in the future. Implementing CRM software can increase sales by up to 29 percent, according to a 2013 report by Salesforce. It can also increase productivity by 34 percent and forecast accuracy by 42 percent. That impact is contingent on combining your CRM with benefits such as marketing and sales automation, not to mention any number of integrations, such as account management and social media. Wondering what’s going on in your customers’ heads? According to Software Advice’s 2014 report, 74 percent of users polled cited their CRM software with helping improve their understanding of customer data. That same report noted that software integration accounted for the biggest hurdle, but the positive results vis-á-vis employee efficiency and customer understanding far outweighed the initial challenges. 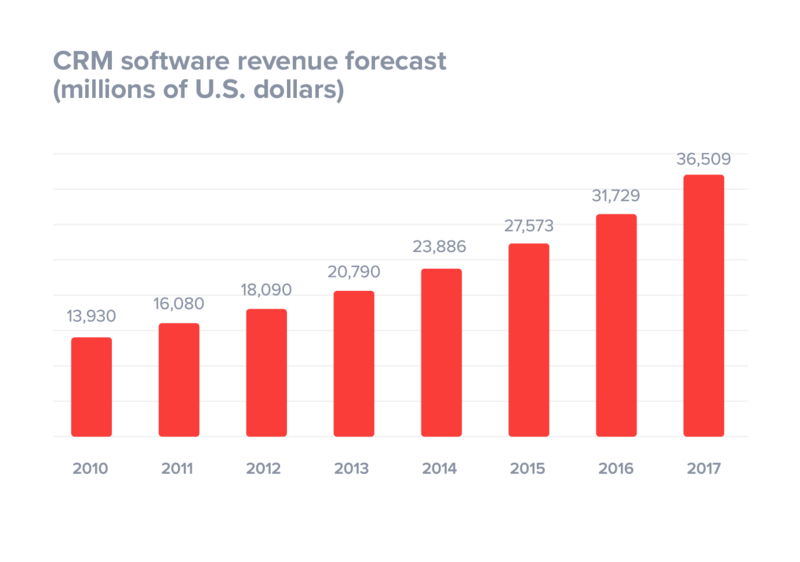 CRM software is the biggest software market in tech right now. In 2017, research company Gartner reported that CRM trumped database-management software for the first time in 2017, and is still on track to remain the fastest-growing market in 2018. “Organizations are keen to avoid silos of information and to obtain a 360-degree view of the customer,” said Julian Poulter, Gartner’s research director in the release. “The 360-degree view allows better application of artificial intelligence to make the users of the CRM system more effective.” Some predictions tag CRM as an $80-billion market by 2025, largely because companies keep buying into technology without dropping out. It’s not a field you want to miss out on. A good CRM software will be a catch-all tool to improve multiple facets of your company. According to a 2013 industry report by Scribe Software, companies found themselves relying heavily on CRM software in four key areas, most prominently with contact management, lead nurturing, email marketing and sales forecasting. To a lesser extent, it also helped with customer service, information management and sales tracking. But we expect that since this data set relies on companies buying into CRM in 2013 while sometimes maintaining old infrastructure, areas such as customer service might have changed (read: improved) since then. The most important aspect of introducing a CRM to your company is how easy it makes the lives of employees. According to that same Scribe report from 2013, 85 percent of small- to medium-sized businesses found CRM software’s ability to centralize customer information important. Seventy-seven percent of respondents found CRMs useful for sharing information between departments, while more than half of respondents found CRMs helpful for reporting on sales and running marketing reports. Any tool or idea that can improve customer retention is a good thing for a business. CRM software is tied to customer retention – “customer relationship” is basically in the name – which means your company will stand a better chance of keeping them onboard once you’ve implemented the software. After all, an overwhelming majority of customers will leave a company because of mediocre customer service – 68 percent of respondents, according to a popular survey by the Rockefeller Corporation. If you can change that by winning customers over, you’re a step ahead of your competition. Need proof that CRMs help with customer retention? 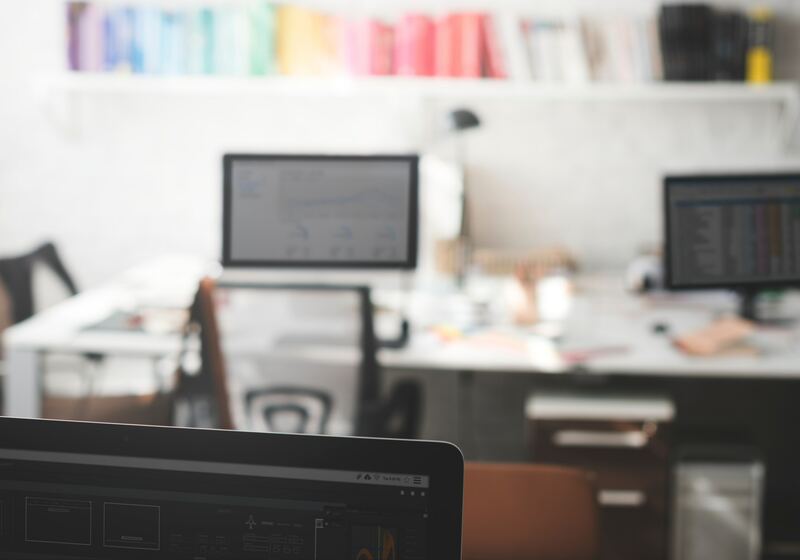 According to a Capterra survey of 500 businesses, 47 percent of CRM users said their CRM system significantly affected both their customer retention and customer satisfaction. According to the report, those two fields were the areas most affected by their respective company’s CRM introduction. Look, what it boils down to is this: CRM software works. Data-driven and anecdotal evidence prove it. But you’re also just reading a quick blog post to glean some easy stats to show your boss to get company buy-in for a CRM introduction. For more information, seriously, just call someone who knows a lot about this stuff, and that person will be happy to walk you through the rest of it. They might even have a few more stats to help build your case.